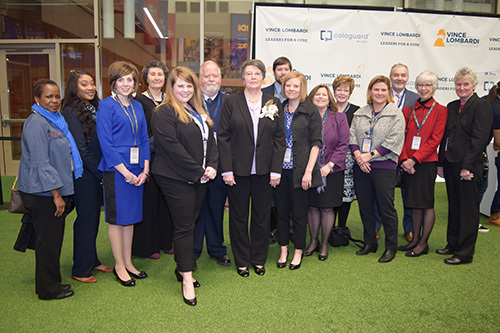 Catherine surrounded by supportive family, friends and colleagues at the Lombardi Cancer Foundation Leaders for a Cure ceremony. 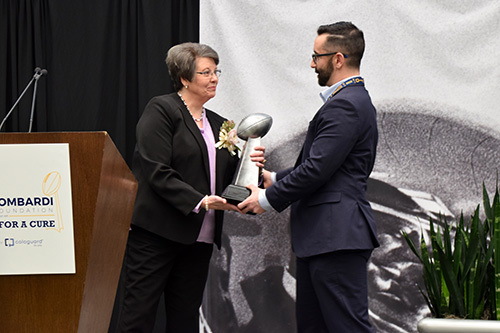 Catherine receives the Vince Lombardi Cancer Foundation Leader for a Cure Award from Ben Haas, president of the Vince Lombardi Cancer Foundation. Catherine at the Leaders for a Cure ceremony held at the College Football Hall of Fame. 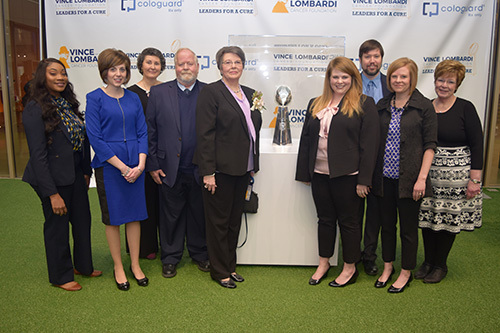 Catherine with family and friends pose with the Lombardi Trophy. 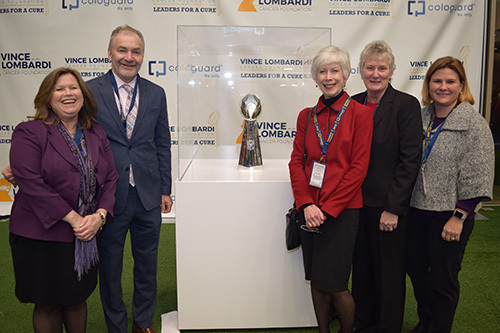 Leadership from Winship and Emory with the Lombardi Trophy. 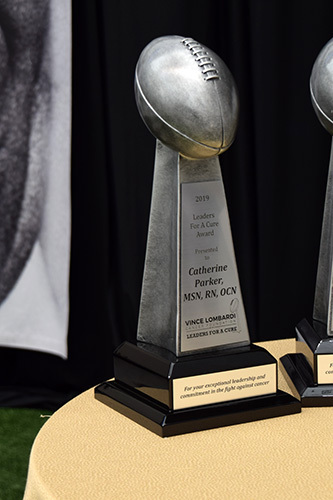 Catherine's Vince Lombardi Cancer Foundation Leader for a Cure Award. 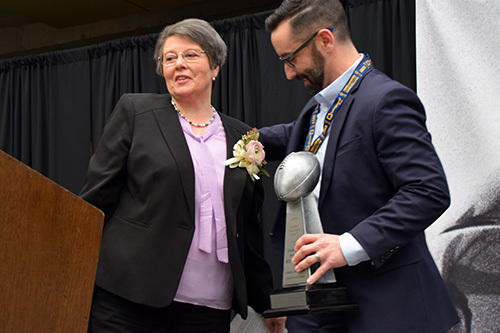 Ben Haas, president of the Lombardi Cancer Foundation, hands Catherine the Vince Lombardi Cancer Foundation Leader for a Cure Award. Catherine addressed the audience with appreciation to those who support and inspire her everyday. 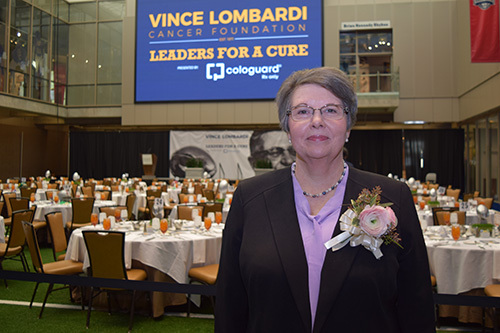 Catherine Parker, MSN, RN, OCN, unit director of the Winship Cancer Institute of Emory University Ambulatory Infusion Center on the Clifton campus, is a recipient of the Vince Lombardi Cancer Foundation Leader for a Cure Award. 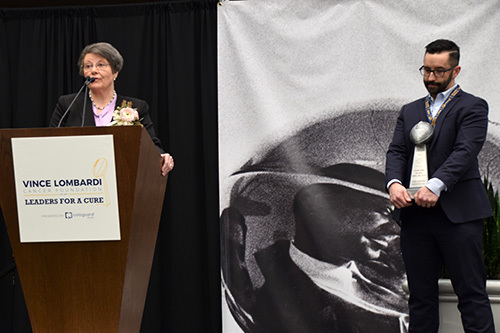 Parker was honored at a ceremony January 31st at the 2nd Annual Leaders for a Cure ceremony at the College Football Hall of Fame. Other recipients of the award include Atlanta Falcons quarterback Matt Ryan and the Aflac Cancer and Blood Disorders Center. During her 40 year-career at Emory, Parker has touched the lives of thousands of cancer patients. She says "I value honesty, transparency and integrity, when it comes leading my team and working with patients. I try to be with them fully in each moment." In 2006, Parker was named unit director of the Winship Infusion Center. She leads a team of approximately three dozen oncology nurses. "We had many amazing nominations that show just how much of an impact people are making to advance cancer research and compassionate care." said Benjamin R. Haas, president of the Vince Lombardi Cancer Foundation.